Class I Malocclusion: A malocclusion with the proper molar relationship with teeth that are crowded together, spaced apart, an overbite, an openbite, a posterior crossbite or an anterior crossbite. 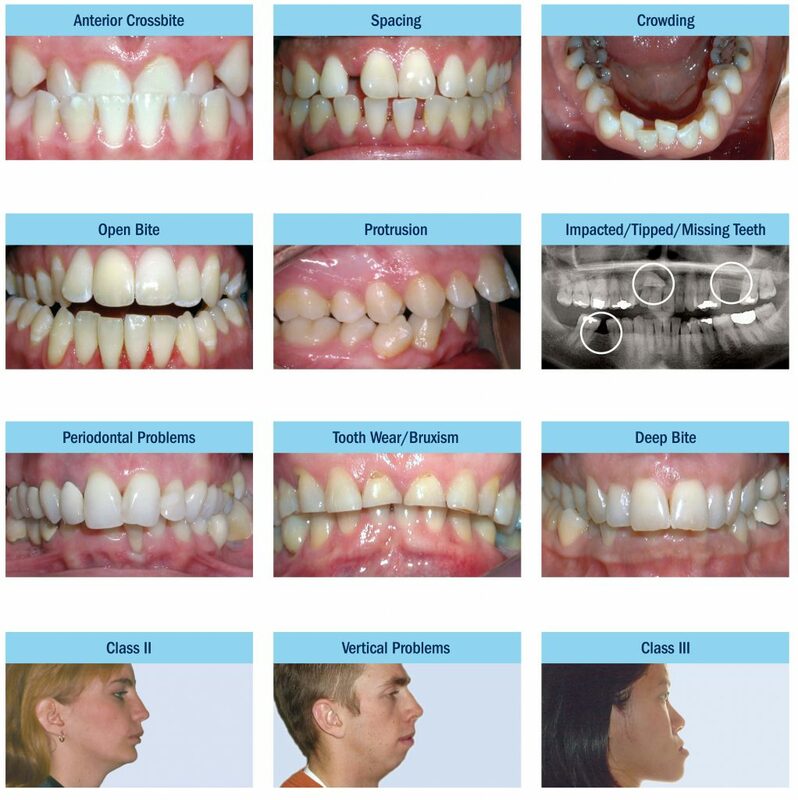 Class II Malocclusion: A malocclusion with the upper teeth positioned ahead of the lower teeth. Class III Malocclusion: A malocclusion with the lower teeth positioned ahead of the upper teeth. Spaced Teeth: When the gaps between teeth are too large, this problem occurs. This can occur if there is a lot of room for your teeth in your jaw. Spacing creates large gaps between teeth and it is common for food to get stuck in these spaces, which can lead to tooth decay. Overcrowded Teeth: In contrast to spacing, overcrowded teeth occur when there is not enough room in the jaw for your teeth. Overcrowded teeth are difficult to clean and eventually this difficulty may result in tooth decay and bad breath. This problem may also result in some teeth becoming more worn down than the rest of the mouth. Open Bite: This orthodontic problem occurs when the jaws and teeth don’t meet together. Chewing, biting into food and eating become difficult as a lot of force is exerted for this function. This causes wear and damage to your teeth. Overbite: When the upper jaw protrudes over the lower jaw, overbite occurs. This condition may cause the lower teeth to hit the back side of the top teeth or gums, which in turn may cause damage to your teeth and gums. An overbite also makes chewing difficult. Underbite: This is the lay term for condition when the lower jaw is protruding over the upper jaw. An underbite may cause damage to the front teeth and make eating and chewing difficult. Crossbite: This orthodontic problem occurs when the teeth in one jaw sit on the wrong side of the teeth on the other jaw. Teeth involved could be in the front, back, or both. This problem may cause damage to the teeth involved. Protruding Teeth: When front teeth point forward and even outside the mouth, this is called protrusion. This distorts facial harmony. The most commonly protruding teeth come out of the upper jaw. Such teeth are more likely to get damaged in accidental falls during sports or other accidents. Midline Discrepancy: This orthodontic problem occurs when the midline of the face does not match the middle of the upper and/or lower teeth. If you feel that you are suffering from any of the orthodontic problems stated above, you should meet your orthodontist as soon as possible. Some of these problems may be more easily rectified if your children are younger.